For the first time in nearly 57 years, Barbie has realistically thick thighs, flat feet not doomed to a lifetime of stilettos and, finally, hips wide enough to conceivably birth a baby! By itself, the transformation in Mattel's new Curvy version of its iconic doll is enough to make headlines. 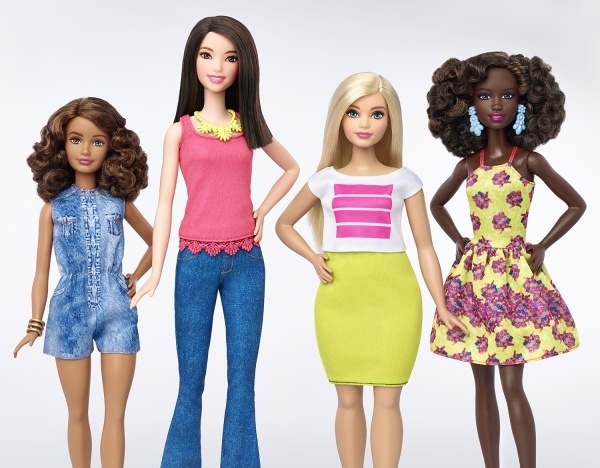 However, this is just one of three new body types -- including Petite and Tall -- introduced as the toy company expands its Barbie lineup. Plus, the lineup includes a wider variety of skin colors and hair textures. Barbie's pale, blonde and impossibly proportioned good looks have long drawn the admiration of young women and the ire of those concerned about Barbie's effect on healthy self-image. Barbie's creator, Ruth Handler said, per Mattel's own historians, that she created the doll because she was inspired by her young daughter, Barbara, who enjoyed playing with paper dolls. The first Barbie doll unveiled in 1959 at a toy fair was titled Barbie, the Teen-Age Fashion Model. Thus began the journey of a doll that looks like few of our daughters ever will, even in their teenaged years. While Barbie went on to offer role-play in various careers, she's never strayed from that teenie-tiny wisp of a waist and fashion runway look -- until now. The new Mattel lineup of Barbies is called its Barbie Fashionistas line, and promises to deliver seven different skin tones, 22 different eye colors and 14 different facial variations in all. This expansion in choices can be empowering for children, said Dr. Robert Holloway, professor of psychiatry and pediatrics at the Children's Hospital Los Angeles and USC Keck School of Medicine. "I think it's great that kids will have more choices for their dolls. We express a lot with our choice of objects, especially such personal objects as dolls. I'm glad that kids will have more choices and hope their parents and peers will allow them to make their choices without too much pressure. Making a choice will always be met with scrutiny by others. Sometimes our choices are supported and sometimes they're discouraged. This is a part of life we all must navigate." Chair of the gender studies program committee at Missouri State University, Shannon Wooden, agrees that the range of choices can be positive for children. Yet, she cautions parents to recognize dolls within the larger context of overall influence. "Yes, it’s a good thing to broaden the range of physical types available for this kind of projection through play. Giving the child a range of bodies that she can see as beautiful and powerful and full of potential will certainly help to dismantle the rigidly-defined beauty ideal that has for so long prevailed. But to be culturally widespread, this dismantling has to go on everywhere — film, television, music — and to be consciously endorsed by parents and teachers. "Parents can ask different questions about (and pay different respect to) women’s bodies, besides how they look: What can they do? How do they feel? What have they accomplished, and what could they aspire to do? Parents can shift to more objective language about women’s bodies (rather than subjective): Whether or not she’s “beautiful,” for instance, traditional Barbie is undeniably tall, and that might be a positive trait in certain circumstances without being a beauty standard." Mattel's updating of the Barbie line comes as the company announced its 2015 fourth-quarter profits were up considerably over the previous year. This follows years of declining Barbie sales during increasing competition from other doll makers. The Fashionistas line retails for just $9.99 per doll, widening its mass-marketing appeal and accessibility. "The introduction of Barbie dolls with different features and body types is a marketing scheme aimed at reversing skidding sales, not feminist leadership. At best, this is a lame attempt at updating a throwback, a trailing indicator of our changing society and culture. At worst, Mattel is offering a marginally less unhealthy beauty image to our children, our daughters in particular, but one that still centers on looks and accessories rather than brains and athleticism. "They're also bad for the planet and the people who make them. Most of what I can find online indicates Barbies are made of various plastics, including PVC, which is exceptionally bad at all stages of its life cycle. Vinyl chloride is a known human carcinogen, particularly dangerous to the workers who produce it." Despite a downturn in doll sales in recent years, Mattel boasts that Barbie is still responsible for more than $1 billion in sales worldwide. Barbie still has bragging rights as the single most popular doll sold in the United States. Anne Brock is a University of Missouri journalism alumna and television news producer. She blogs at <a href="http://FlourSackMama.com">FlourSackMama.com</a&gt; about simple living and greener approaches to life for everyday families. She also freelances as a social media consultant and content creator.